My Italians came to visit this week! Yes, the same ones whose lights I couldn’t turn off, who have carted me to their country house, who took me on my first moped ride, who have been the most generous and kind hosts I could ever ask for on every visit I’ve made to Italy since I was 16 and I stayed with them for 3 weeks one summer. Other destinations called, however, so they only could come to Tucson for a mere 48 hours, and I could only see them for about 36. 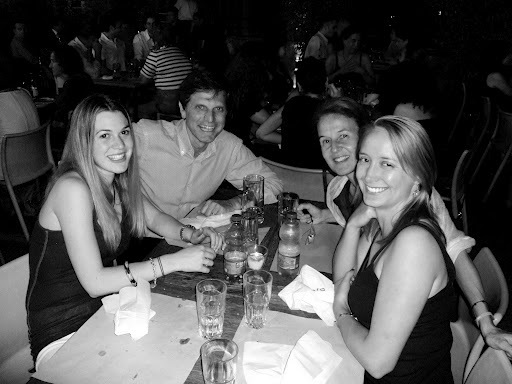 Rome 2011: Dinner with Esa, Pompeo and Maddalena. Their son, Umberto, was at summer camp in the USA! So what did we do with Italian tourists in Tucson for such a short time? I’ll tell you! 6p.m.ish: Pick up Italians from airport. Try to take them to eat at Mi Nidito, one of Tucson’s most famous Mexican restaurants. President Bill Clinton ate there when he visited Tucson. They have since then named the platter he consumed the President’s Plate. Arrive at restaurant to find that it is closed, even though it is Tuesday. People, learn from this: Mi Nidito is closed Monday and Tuesday. Because they can be. 6:15p.m.ish: Call our back-up restaurant, Feast (another one of my absolute favorite Tucson eateries). Find out that they won’t have any openings for a few hours due to a crazy big reservation. Italians have spent 13 hours in flight, and it is about 3 a.m. their time. Need food sooner. 6:25p.m.ish: Take them to Downtown Kitchen instead! This time, I got the orecchiette with mushrooms, asparagus, braised duck and noticed that they misspelled orecchiette on their online menu…We also devoured the desserts: warm apple & pear crumble, featuring ancho caramel, streusel & cinnamon ice cream and one of the tastiest chocolate cakes I may have ever eaten, Ibarra chocolate cake with Kahlua ice cream & almond candy. 8:30p.m.ish: Go home, settle in, drink tea, catch up. I took the day off work, figuring if an event like this isn’t worth doing so, then few are. 9 a.m.ish: Go to Chez Button, where our guests are residing for their visit. Find that Maddalena is feeling a little out of sorts. Agree to run errands for dinner and sorting out international phone issues while naps occur. 9:30 a.m.ish: Pompeo and I embark on an epic and grueling trek to figure out how to make Maddalena’s Blackberry work in America. Lots of discussion is bandied about regarding GSM, SIM cards, internet settings and network configuration. Something about wifi. Go to 3 different stores. Give up. 10:15 a.m.ish: We continue on this journey to pick up buns for our cookout dinner tonight. My mother has reserved torta buns from La Estrella Bakery. La Estrella provides some of the finest tortillas and baked goods in the area, but I’ve always ever seen them at stores rather than at the bakery. Unbeknownst to aforementioned mother, said bakery is located very far away, in South Tucson. Pompeo and I kept driving south and south and south, and finally we found it. So worth it. Apart from being a really authentic Mexican bakery, they have super prices. We got a dozen torta buns and I couldn’t resist a pineapple empanada, and it was like $5 for all of it. 11 a.m.ish: Drive all the way from South 12th Ave & Irvington to Prince & Campbell, where we picked up the evening’s dessert: fruit tart from La Baguette Bakery. If you’ve never been there, it’s a part of Ghini’s French Cafe, and was another worthwhile expenditure of gas (after these couple of days, I wouldn’t want to know what my carbon footprint was…). 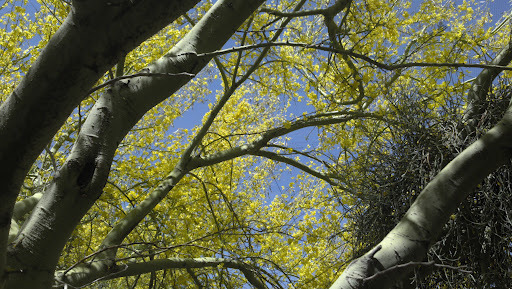 A palo verde blooming. I had forgotten how vibrant their colors are, and juxtaposed against our clear blue Sonoran sky, they’re quite magnificent. 1p.m.ish: Take the Italians to arguably the most important place if your visitors are only here for a brief time: The Arizona-Sonora Desert Museum. That’ll get its own entry, as I have many photos and it certainly deserves a detailed heart post. Admire blooming palo verdes, napping mountain lions, and newborn hummingbirds. 5:15p.mish: Start preparing dinner! Welcoming guests! 6p.m.ish: Take advantage of Tucson weather and grill buffalo burgers in the backyard. Eat them, some fresh, home-made gazpacho, and Mediterranean salad. Drink good wine and relish good company. 9:30p.m.ish: Relax once everyone has left. Figure out how to fix Blackberry with some handy googling! Download WhatsApp, an app that makes it easy–and free–to message internationally so I can keep in better touch with my friends. 10:30p.m.ish: Be sorry that the day is over, but happy that I will be back in Italy soon! Note: Since our friends didn’t have a flight until the next afternoon, they also liked walking around at the University of Arizona, my alma mater (and also where my mother and Maddalena met 30+ years ago. Go, Wildcats!) and an elegant lunch at the Arizona Inn. Overall, it was a marvelous visit. Although Wednesday morning was spent riding around in my car to various bakeries, it was still an adventure during which I got to see more of my own city, and Pompeo got to see more of Tucson. Also, now I know where La Estrella is if I ever am craving the perfect tortilla! Where would you take guests if they were here for only a couple days? Share in the comments! Good idea! Zemam's should go on my heart list…If this visit had happened about a month or so earlier, it would have been perfect to end our Desert Museum trip with a short sunset hike up at Gates Pass!